I first began reading books by Mindy Starns Clark when I was living in Georgia 10 years ago. My friend, Dorina, was in Alaska, so we started a long-distance book club! We looked for fun books to read together, and we settled on The Million Dollar Mysteries series. We both quickly became fans of Mindy's books. Recently I have enjoyed reading the Cousins of the Dove series, written by Mindy Starns Clark and Leslie Gould. When I heard they were looking for bloggers to be on their launch team for the final book in the series, I jumped at the opportunity! I was sent a complimentary copy of My Daughter's Legacy from the publisher. All opinions are my own. My Daughter's Legacy is the third, and final, book in the Cousins of the Dove series by Mindy Starns Clark and Leslie Gould. Each book follows two stories: one historical and one modern day. The historical story is new in each book, but the modern-day mystery is woven throughout all three books. Fans of the Cousins of the Dove series will appreciate this final book and the exciting way the past and present combine to solve a decades-old mystery. Enough background information is given in My Daughter’s Legacy that you can read this book without having read the first two novels. However, I would recommend starting with the first book to gain the most background information on the cousins and the mystery. The historical story in My Daughter's Legacy is about Therese Jennings, a young woman living in Richmond, Virginia during the Civil War. Therese works as a governess, and she uses her spare time to work at a hospital caring for wounded soldiers. Despite the difficulties and dangers of war, Therese stands for what is right, even when it means personal sacrifice and risk. The modern day story in this book primarily follows Nicole Talbot, one of the cousins who is a descendant of Therese Jennings. Nicole is a recovering drug addict who is working to keep her life on the right track and finally open up to her family about past secrets. Nicole finds much healing, and the four cousins find answers to the murder mystery that has burdened them since childhood. Mindy and Leslie weave these two stories together in a way that flows seamlessly. The modern day cousins learn about their ancestor, Therese, through pictures and letters passed down through the family. Therese's hard work, ethics, and faithfulness in hard times had an impact on future generations. She left a legacy for her descendants, and this story inspires readers to consider the legacy they are leaving for their children and the generations to follow. 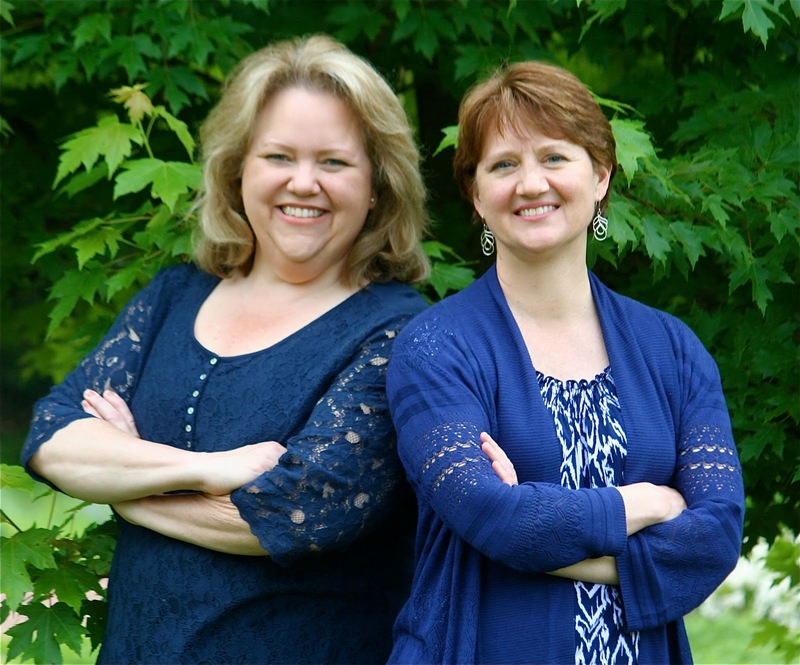 If you like historical fiction and mysteries, you will love this book series from Mindy and Leslie! 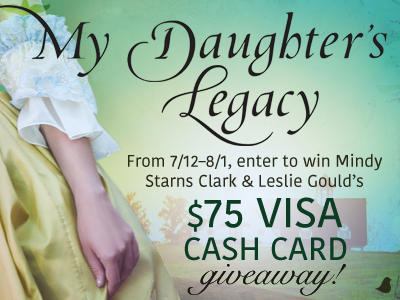 If you are interested in reading My Daughter's Legacy, you can enter the giveaway for a chance to win a copy of the book and a $75 Visa cash card! 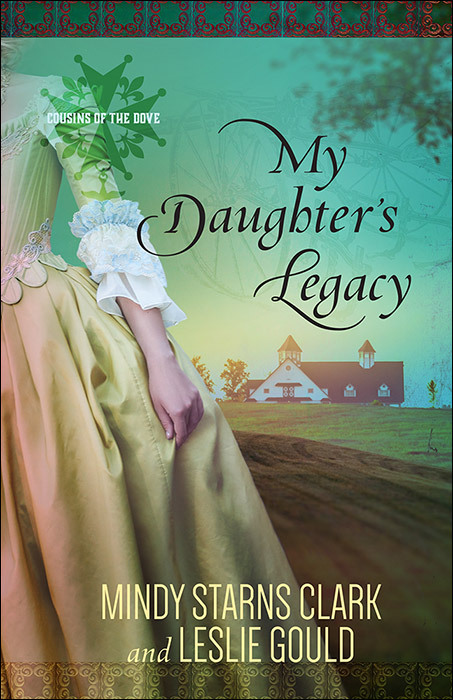 You are also invited to attend the My Daughter's Legacy Author Chat Party on Facebook on August 1 at 8:00 EDT. The winner of the giveaway will be announced during the party. Lastly, because I love a good book deal, if you are interested in reading the Cousins of the Dove series, all three kindle books are currently on sale! Mindy Starns Clark is the bestselling author of more than 20 books, both fiction and nonfiction, with over a million copies sold. Mindy and her husband, John, have two adult children and live in Pennsylvania. Find out more about Mindy Starns at http://mindystarnsclark.com. Leslie Gould, a former magazine editor, is the author of numerous novels, including “Beyond the Blue” and “Garden of Dreams.” She received her master of fine arts degree from Portland State University and lives in Oregon with her husband, Peter, and their four children. Find out more about Leslie at http://www.lesliegould.com.